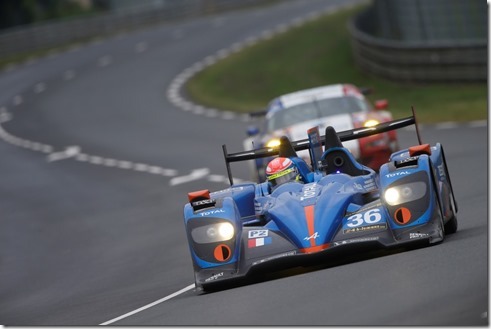 LE MANS 24 HOURS 2014 (June 14 & 15) ALPINE AND NELSON PANCIATICI HAVE PREPARED WELL! The Signatech-Alpine team completed their programme of tests planned for Test Day, and showed how competitive the Alpine A450b can be without really driving for performance. Nelson Panciatici was third-fastest in the tests and feels ready to take on the 24 hours of Le Mans! It will be his third time on the Circuit de la Sarthe. He reached the foot of the podium in his first year and battled his way up the ranks last year. The Signatech-Alpine team, managed by Philippe Sinault, and Nelson Panciatici have turned this Le Mans 24 Hours into a major objective. The fight in LM P2 will be intense with more than 20 cars signed up in this class. The Signatech-Alpine team are ready to fight for lead positions and Nelson Panciatici will do his best to help them! Join Nelson’s Fan Club on Facebook! 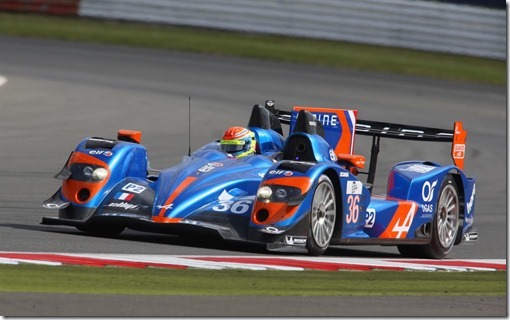 EUROPEAN LE MANS SERIES 2014 – ROUND 1 4 HOURS OF SILVERSTONE (April 18 & 19 2014) ALPINE AND NELSON PANCIATICI SCORE THEIR FIRST CRITICAL POINTS! 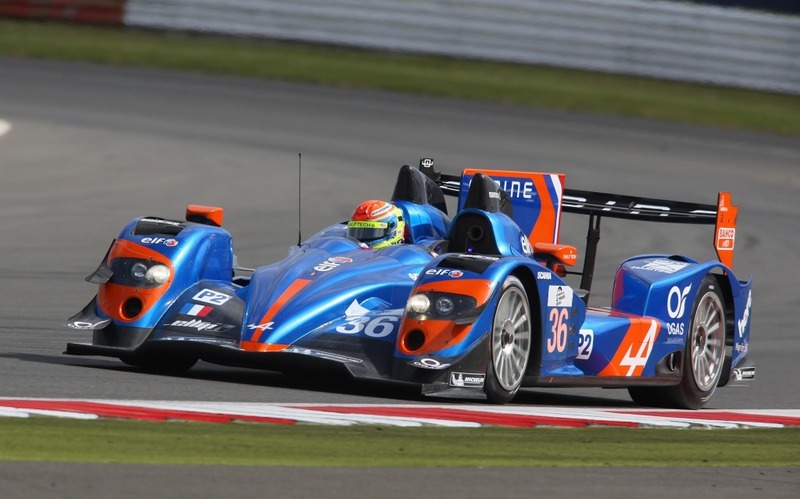 By finishing fifth in the 4 Hours of Silverstone, Nelson Panciatici and the Signatech-Alpine team score their first points. If their objective is still victory, Nelson Panciatici knows these hard fought ten points will be important in the final score and that they will have to score at every stage of the European Le Mans Series to hope to win the title for a second consecutive time! 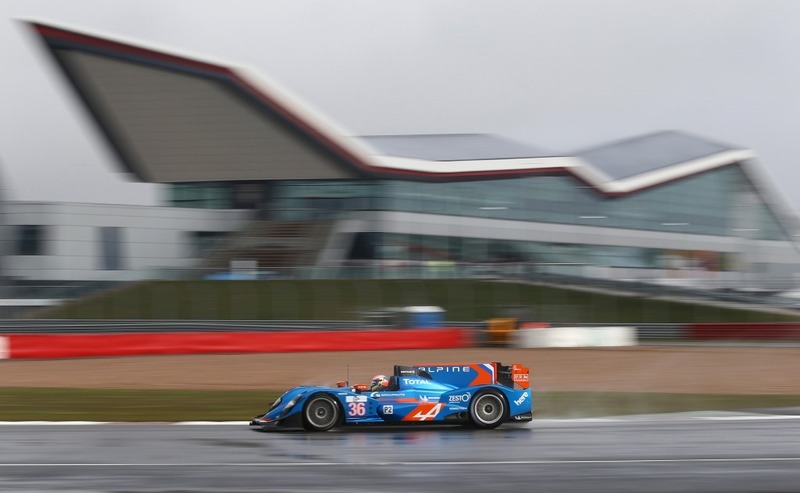 They spent free practice on Friday looking for the best technical solutions to adapt the Alpine A450 and their new Michelin tyres to the particularities of the Silverstone circuit, the Signatech-Alpine team came to a good compromise. This is what allowed Nelson Panciatici to qualify in seventh place, while closing the time gap considerably on the best. Nelson had an excellent start and held fifth position, but premature wear on his rear left tyre stopped him from climbing higher. He then passed the wheel to his co-drivers, Paul Loup Chatin and Oliver Webb. They pulled off their gamble at the end of the race, not going into the pits because they’d saved enough fuel while the security car was out due to a collision between two LMP2s, and the Alpine A450 crossed the finishing line in fifth place. The Signatech-Alpine team and their drivers will now prepare for the next challenge of the European Le Mans Series which will take place on the Imola circuit on May 17 and 18 where they will definitely want to make the colours of Alpine shine once more! 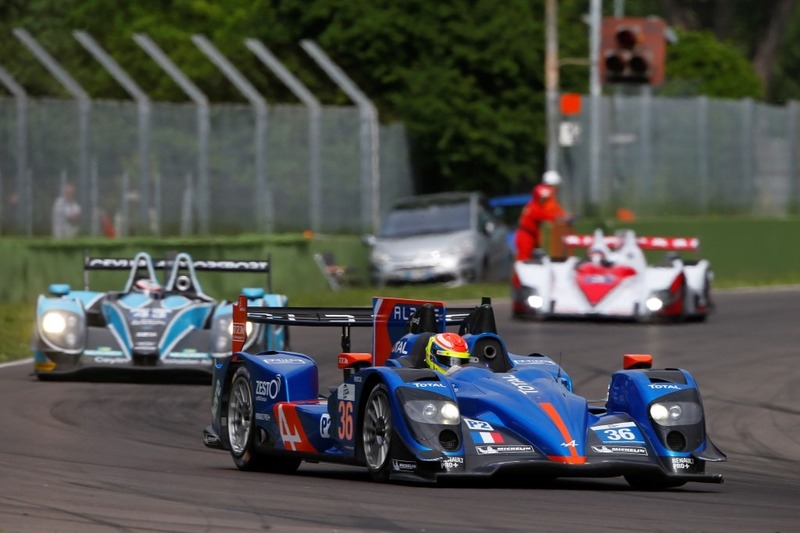 EUROPEAN LE MANS SERIES 2014 NELSON PANCIATICI TO DEFEND HIS TITLE WITH ALPINE! After many international successes in Endurance and, not least, the unforgettable general ranking victory of the 1978 24 Hours of Le Mans; Alpine and their drivers, Nelson Panciatici and Pierre Ragues, snatched victory in the 2013 European Le Mans Series (ELMS). 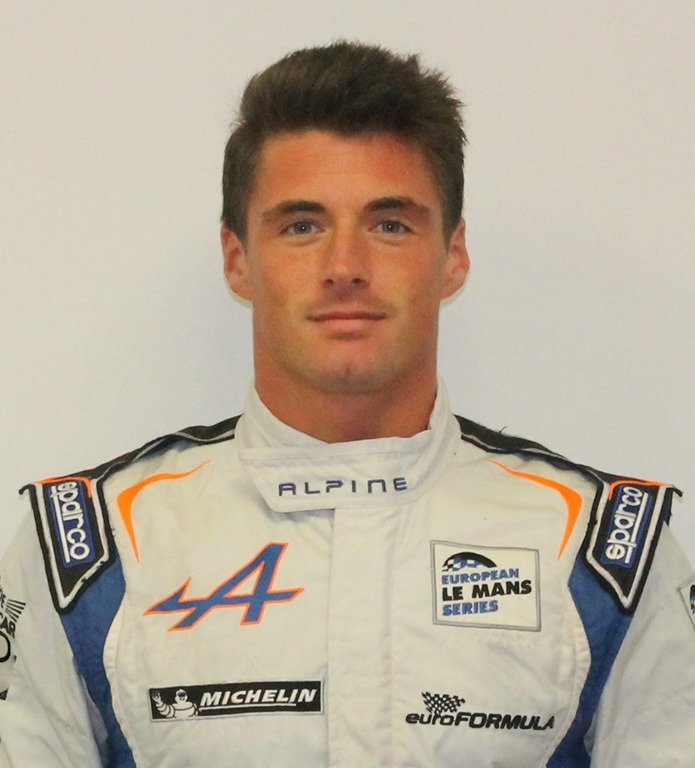 Now Nelson Panciatici puts his title back into play as official Alpine driver. 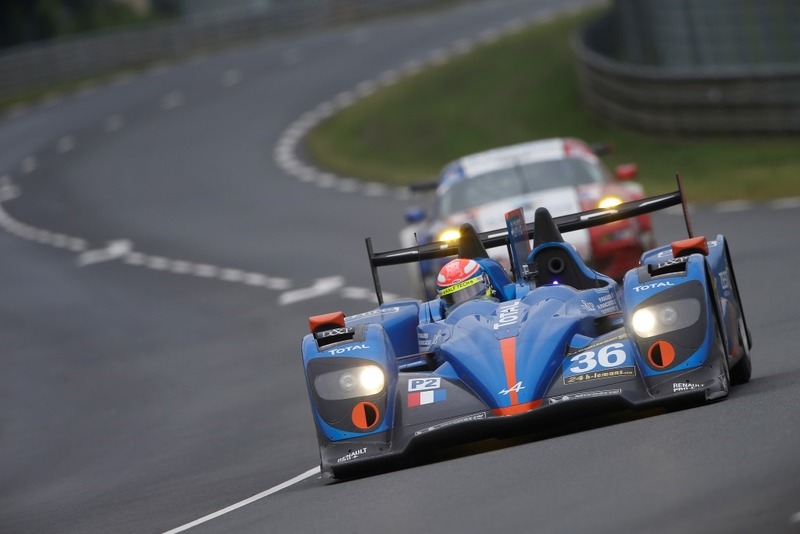 Just as he lit up the championship and was instrumental in the Alpine A450’s claw back at Le Mans 24 Hours last year, so he is back on the Signatech-Alpine Team, managed by Philippe Sinault, in the European Le Mans Series and Le Mans 24 Hours. His cohorts this year will be Frenchman Paul Loup Chatin and Englishman Oliver Webb. From the start, Nelson Panciatici has played his part in Alpine’s comeback at the highest level and he would not, not for anything in the world, miss the opportunity to get behind the wheel of the Alpine A450 equipped with Michelin tyres: "Ever since I helped lift the ELMS trophy I’ve had just one ambition: to go back and score new victories. We have to defend our title and shine at Le Mans. I am lucky to be in a team of passionate and competent people that I’m getting to know better all the time, which is important, especially in endurance. I also have a great time with them! I had other offers, which I looked into very seriously, but I wanted to stay with Alpine because racing for such a legendary constructor is incredibly lucky for a young racing driver. I think that my co-drivers and I have the means to aim for victory, right from the start of the season. When a title is back in play, everyone’s expectations are naturally high but I feel I can take on that responsibility because I know the whole team is behind us to help and give us a good car. I hope we have as good a season as we had last year!" Some great racing drivers such as Patrick Depailler, Jean Pierre Jabouille, Henri Pescarolo, Didier Pironi, Jean Claude Andruet, Jean Luc Thérier as well as Jean Pierre Jaussaud and many others have taken titles simultaneously in rallying, single-seater and prototypes with Alpine. The Signatech-Alpine team picked up the baton in 2013… Rest assured that Nelson Panciatici and the whole team are ready to take on the challenge and continue to write the Alpine story! TEST DAY – LE MANS 24 HOURS 2013 (June 8 & 9) A GOOD DAY FOR THE ALPINE A450 AND NELSON PANCIATICI! The Test Day was the occasion when Nelson Panciatici, long time holder of the best time in LMP2, finally finished second at the wheel of his Alpine A450! The track remained damp for a good part of the day but the Signatech-Alpine team still managed to test all the important items on their program. The Signatech-Nissan team will now study the data they gathered during these tests and continue their preparation for the coming Le Mans 24 hours which take place on June 22 and 23, a podium would be just the right reward! Nelson Panciatici and his co-driver, Pierre Ragues, crossed the finishing line of the 3 Hours of Imola in second place. With this first podium, the Signatech-Alpine team and their drivers are now in second place in the provisional rankings of the European Le Mans Series Championship. For its roaring return to Imola, the Alpine marque did not pass on the opportunity to shine from first practice, with a best time for Nelson Panciatici. The performance in free practice, with a full tank of fuel, augured well for a good qualifier but a slow puncture relegated the Alpine A450 to the second line which penalised them at the start of the race. While Nelson had to be satisfied with following the pace on a circuit where it is difficult to overtake, the Alpine driver snatched the best time during his relay. Nelson Panciatici was the first to come back into the pits to hand the wheel to Pierre, his co-driver, who went out into a double relay after a change of tyres. This offset strategy compared to their competition was to serve them well by the end of the race. He relinquished the wheel to Nelson after a great relay in which he closed in on the race leaders. Unfortunately, a problem at restart cost them some thirty seconds. Nelson Panciatici went straight into battle to quickly reach second place. He then tried to put pressure on the leaders by taking back more than 30 seconds before relaxing his pace in the last two laps. Nelson crossed the finishing line some 40 seconds behind the winners to give Alpine its first podium since victory in the Le Mans 24 Hours of 1978. As early as next week, the Signatech-Alpine team start their tests in preparation for the Le Mans 24 Hours. Nelson Panciatici, Pierre Ragues and Tristan Gommendy will be at Magny-Cours for the night trials. They will then be present on June 9 for the Le Mans 24 Hours Test Day, with the new aerodynamic kit. The Alpine A450 wants to celebrate the 90th anniversary of the Le Mans 24 Hours as it should! 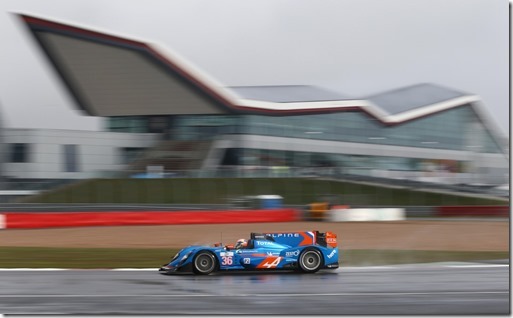 EUROPEAN LE MANS SERIES 2013 – ROUND 1: 3 HOURS OF SILVERSTONE (April 12 & 13) RAIN SPOILS ALPINES AND NELSON PANCIATICI HOPES! In its comeback to competition after 35 years away, the Alpine A450 managed by the Signatech-Alpine team and with Nelson Panciatici and Pierre Ragues behind the wheel, finished fourth in the first round of the European Le Mans Series. The race was unfortunately interrupted 40 minutes before the end after more than one hour behind the safety car because track conditions were considered too dangerous by the Race Directors. The Alpine A450 will nevertheless have held lead positions in the ranking after a very good start by Nelson Panciatici. The Alpine A450 displayed its potential from the very first free practice race where Nelson Panciatici made the best time in the first session and the second best in the second. For the qualifiers, Nelson as opposed to his main competitors, immediately took the battle to the track from the start of the session because rain looked imminent and the risk later would be too great. The Alpine driver still managed the third best time under the watch of Carlos Tavares, Renault’s Chief Operating Officer, who came to support the whole Signatech-Alpine team. The track was dry when all the competitors launched into the race but it started to rain during the formation lap. Nelson Panciatici, who started from third position on Michelin’s slick tyres, was in the lead from the opening corner until the safety car came out for the first time at the end of lap one, cancelling the advantage of his excellent start. Nelson went back into the pits after five laps to change tyres to intermediate and set off again in ninth position before climbing back to join the three leaders and made the second best time of the race while he was at it. 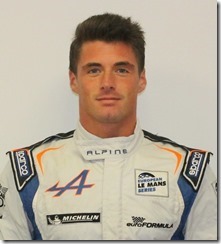 His co-driver, Pierre Ragues, then took the relay on Michelin’s wet tyres. Starting in fifth position, he rapidly gained a place before the safety car came out on the track again. The Signatech-Alpine team and their drivers will now get ready for the next round of the European Le Mans Series which races on May 17 and 18 on the Imola circuit in Italy where they will definitely want to make the colours of Alpine shine! 35 years after its historic victory at Le Mans 24 Hours, Alpine is back in the competition for the first leg of the European Le Mans Series at Silverstone. The whole Signatech-Alpine team is ready to take on the challenge and bring the Alpine legend back to life for thousands of fans looking for a great start! Since the announcement of Alpine’s comeback, the world media has underlined the enthusiasm this news has provoked, even the young generation have taken to Twitter with ‘Alpine is back’ and they want everyone to know it! 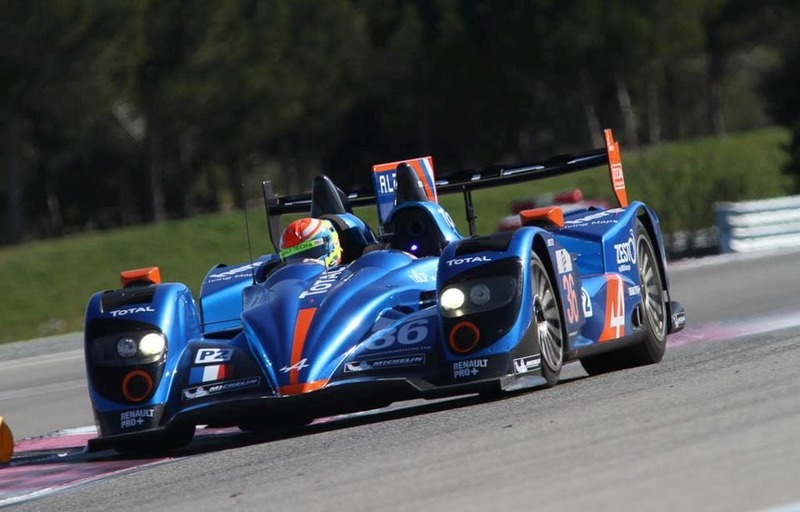 During the group tests in Castellet for the ELMS, the Signatech-Alpine team, managed by Philippe Sinault, focused on the Alpine chassis development in partnership with Michelin, historical partner in pneumatics. He wasn’t aiming for a score at any price, but Nelson Panciatici still managed the fastest time, which is looking good for Silverstone. 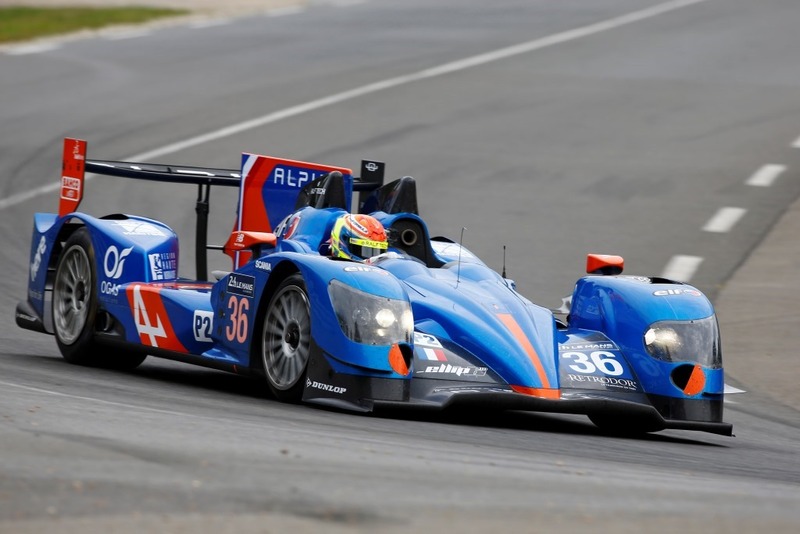 The Alpine No 36 is ready to fight its first race in the United Kingdom. Carlos Tavares will also be making the trip to follow the marque’s comeback live. This capital support will be a fantastic boost to the whole Signatech-Alpine team and its drivers, which is just what they need to face the competition! They have signed some nice performances this season with a fourth place in the 24 Hours of Le Mans and a superb podium at Silverstone. Nelson Panciatici and his co-drivers, Pierre Ragues and Roman Rusinov hoped to bring home a victory or at least a podium from Japan. Having held their own in lead positions during free practice and won a fourth place in the qualifiers despite the traffic, Nelson Panciatici was not able to make it happen. A reluctant starter destroyed all hopes of the G DRIVE BY SIGNATECH NISSAN team, making them lose more than 10 minutes in the pits. The Oreca #26 finally crossed the finishing line in seventh place, the only satisfaction was the best time for LMP2s in the race where Nelson Panciatici proved, if it were still necessary, that the performance is definitely there! Nelson: "We set off at the start to win and from that point on we can only be disappointed. But to hope to win we have to have the means and that was the case, it will be our grounds for satisfaction this weekend. Damien, our engineer, gave us an efficient and fast car. Our race relays were fast right until the end thanks to the good wear on our Dunlop tyres. My only small regret was not to have been able to put together all my best moments in the qualifiers because my "ideal time" was at the same level as the best times. It bodes well for the next race and we now have to think of the last leg in China where we want to go in with the best conditions to step up once more on the podium!" 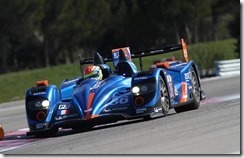 As a consolation prize, the best LMP2 time was set by Nelson with a lap of 1.33.453. However, I am extremely disappointed as Roman and Pierre had done a great job. It is clearly a weekend to forget ! We now have to concentrate on our last round in China, at the Shanghai circuit, to finish the season with a good result !" The next meeting, the 6 Hours of Shanghai in China, will be fought out on the 27 and 28 October, this race will end the 2012 season of the World Endurance Championship and the whole G DRIVE RACING BY SIGNATECH NISSAN will want to answer the roll call! Finished with the high temperatures and sand of Bahrain, the G DRIVE RACING BY SIGNATECH NISSAN team now head for the Land of the Rising Sun to take part in the 6 hours of Fuji on the fast Fuji Speedway track. Nelson Panciatici will continue his apprenticeship although he is craving first place! Nelson: "I’m going into this race full of confidence because Bahrain again showed that we are competitive. We have a fast and well-balanced team, we just need a bit more success, up to us to make it happen! Our Oreca 03 Nissan is very efficient and easy to drive, we are able to aim for victory even if the competition is tough. I don’t know the Fuji track but I worked hard in the simulator and watched a lot of videos, we also have a full day of practice so it shouldn’t be a problem. We are in the last part of the championship with two races left to make our mark. The challenge is considerable but we all want to meet and beat it!" The races have followed each other at a high rate but that will not hamper the G DRIVE RACING BY NISSAN SIGNATECH NISSAN who will supply their drivers with a reliable and high-performance car to liven up the LMP2 class and fight for the front row! FIA WORLD ENDURANCE CHAMPIONSHIP – ROUND 6: 6 HOURS OF BAHRAIN (28 & 29 September 2012) NELSON PANCIATICI: MY KINGDOM FOR A LIGHT! It was on the Bahrain circuit, in the crushing heat, that the whole G-Drive Racing by Signatech-Nissan team met up for the sixth challenge of the FIA World Endurance Championship (WEC). Nelson Panciatici and his teammates, Pierre Ragues and Roman Rusinov, were on route to victory when the Race Director pulled them in to the pits because of a faulty race number light on the right side of the car. Conclusion, nearly seven minutes lost and all hope of victory evaporated! Despite all their efforts, they finished the 6 hours of Bahrain in a very disappointing fifth place of the LMP2 ranking. After having mostly worked on tyre wear during free practice, the G-Drive by Signatech-Nissan put Roman Rusinov in charge of the qualifiers where he finished in a very nice seventh place. For the race Nelson Panciatici was once again fast and reliable, taking the lead in the LMP2 class in his first relay clocking some great times before he set the third best time of the race in his last run in which he also overtook two cars! Nelson: "It’s really frustrating because we had all the means to win. The positive point is that we took the lead in the LMP2 category before we had to return to the pits to fix the number’s lighting and we were getting results. Damien, our engineer, improves the car for every race, she is "easy" and fast and if success is on our side, we should have a win before the end of the year. Personally, I am still getting traffic experience and I’m getting better in every race. 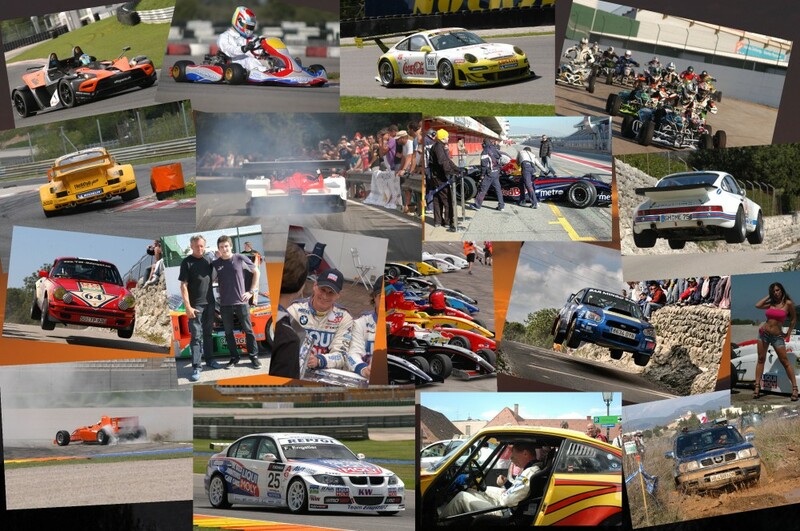 I always get a lot of pleasure driving the endurance races." "I am disappointed and upset! We could have won. We really had the performance and we were up there battling with Starworks and Pecom. Our strategy was perfectly adapted to the race conditions. I found the officials‘ decision very unforgiving. The race number was more than 80% visible, only a few light cells at the bottom of it were defective. I see it as an injustice because the number was visible. We lost the race because of that additional stop and I’m really disappointed especially considering the excellent work put in by the team and the drivers." The next meeting, the 6 Hours of Fuji in Japan, will be fought out on the 13 and 14 October on the fast circuit of the Fuji Speedway! It is on the Bahrain International Circuit, in Sakhir, south of the capital Manama, that Nelson Panciatici takes part in the next challenge of the World Endurance Championship (WEC). Not making the podium, or possibly even winning in Sao Paulo, Nelson wants a victory to confirm the performance he produced in that race. Silverstone ended with a superb podium and the G-DRIVE RACING BY SIGNATECH NISSAN team dominated free practice in Sao Paulo before Nelson Panciatici set the third best times in the qualifiers with his ORECA 03 NISSAN equipped with hard DUNLOP tyres. Their performance places them at the same level as the best teams in the highly competitive LMP2 class where Nelson Panciatici and his co-drivers, Pierre Ragues and Roman Rusinov, are among the favourites! Nelson: "The level of performance we achieved in Sao Paulo has certainly given us more confidence for Bahrain and we really want to prove it with a victory! The whole team deserves it considering the amount of work that has been put in since the start of the season and I will do my utmost to make it happen. I don’t know the Bahrain circuit but I have watched a lot of videos. It looks technical but the practice plan we have should allow us to make our mark. I trust Damien, my engineer, to find the right technical solution that will give us a little bit of an edge. As usual, competition will be tough and we have to take each race as it comes because that’s the best way to get a good result!" "We were among the fastest on the track in Sao Paulo. The car had great performance, without the incident in the warm-up we would definitely have had a podium if not better. We even set the fastest time in the race one hour before the end. Our objective now, and in view of the performance since Silverstone, is to get on the podium again and even get a victory before the end of the season." The battle for victory in the LMP2 class will be tightly fought out and the drivers of the G-DRIVE RACING BY SIGNATECH NISSAN team will most certainly be key players! The G-DRIVE RACING BY SIGNATECH team and their drivers discovered the famous Jose Carlos Pace circuit in Interlagos, Brazil and produced some fine results during practice. Nelson Panciatici made the best time in the last session. For the qualifiers, he missed pole position by just over one tenth of a second with the third best time. Hope for victory was therefore warranted. Unfortunately, Nelson PANCIATICI took a rear collision in the warm-up lap which forced him to return to the stands to change the rear bonnet. He got back into the race with 3 laps to catch up. Nelson and his co-drivers, Pierre RAGUES and Roman RUSINOV fought valiantly to get back into fourth place before they were once again delayed with a ruptured disc brake and lost more than four minutes. Nelson PANCIATICI threw himself into a desperate chase and crossed the line in a very disappointing seventh place considering the performance put on by the full ORECA 03 NISSAN #26 team. A small compensation for Nelson, he will remain overall, for this weekend, the best performer of a lap in the LMP2 category. Nelson: "We are disappointed with the final result because we were certainly one of the most consistent teams and our Oreca 03 Nissan was among the best tuned. Damien, our engineer, gave us an almost perfect car and it was easy to drive. Even after the incident at the start we were still in with a fight for the podium, it’s a real shame but the positive side is that we are sure today that our team driver package is able to aim for victory whatever the track, and that’s important in a category as competitive as LMP2. It bodes well for the rest of the championship. Personally, I learnt a lot again this weekend and I’m beginning to feel the traffic better, my last two relays were good and consistent. I had a great time in full attack mode from the beginning to end of my relays. When we drive single-seaters we think that you have to drive carefully in endurance, I can assure you that it’s far from that!" Philippe Sinault: "We were fighting for fifth place in the end. It’s satisfying to see that we were still in the running all along the weekend and among the liveliest on the track. The car was very high-performance, without the incident in the warm-up with Liuzzi who came and hit us from behind and destroyed a part of the car. That stupid accident deprived us of the podium, if not more. The car was producing better and better results as the temperature fell toward the end of the race. Pierre had done his job by mid-race, Roman drove at a very high pace, and Nelson even signed the best time of the race one hour from the end. We are disappointed of course because success really was within our reach. We will now take the races as they come and try to make our mark with a victory. Since Silverstone we’ve have really stepped up in terms of performance. We definitely have one of the best driver teams and the teamwork is paying off. Bahrain, Mount Fuji and Shanghai will definitely be the stage for a lot of fights on the track. Despite the incidents this weekend, I am still confident for the coming races and I really hope that we take a victory between now and the end of the season." The next meeting, the 6 Hours of Bahrain, will take place on September 28 and 29 on the international circuit of Sakhir which usually hosts the Formula 1. The 6 Hours of Silverstone are the starting gun for a series of five races on three continents in two months. 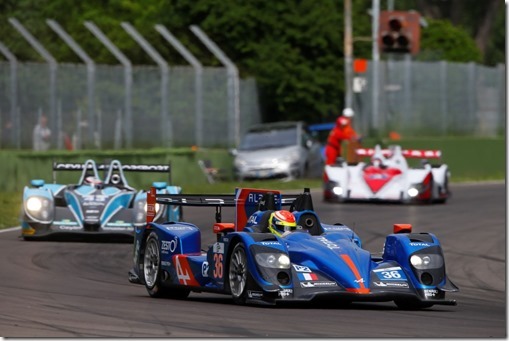 Needless to say, the drivers will have to stay sharp in the face of some very stiff competition in the LMP2 category. Nelson Panciatici continues his apprenticeship at Silverstone, in a discipline he discovered for the first time at Spa Francorchamp at the start of the year and whose characteristics, notably of traffic management, take some time to adapt to. On the other hand, looking back over his first two races, we can say that he’s fast learner! "I feel fully confident as we go into this second part of the season," says Nelson. " We showed them in Le Mans 24 Hours that we were in the competition. My co-drivers, Pierre and Roman, and I form a balanced team and we’re fast with nothing to envy the other favourites. Our Oreca 03 Nissan is very competitive and easy to drive, which is an advantage in the endurance races. Well supported by the full G-Drive Racing by Signatech Nissan team, we’re capable of victory, or at the very least a podium. I know that the competition will be tough but we’ve prepared ourselves well. Also, I know Silverstone well for having raced there in single-seaters and I like this circuit a lot, especially the rapid sequence in the Becketts. We’re not yet half way through the championship, we have five races left to make our mark and we all want to get there as quickly as we can!" The race will certainly be very lively, especially in the LMP2 category, and the whole G DRIVE RACING BY SIGNATECH NISSAN can count on their drivers to battle into the lead! Starting from fourth on the grid the Morgan-Nissan driven by Baguette-Enjalbert-Pla had a perfect race and emerged victorious in the Donington 6 Hours. This car was entered by Jacques Nicolet’s team only a few days before the event, and although it was the spearhead of the French squad’s attack it had been hit with problems in the days prior to the race. On Friday it had an engine problem and water in the fuel on Saturday. All these glitches reduced the track time of no.35’s drivers, in particular Olivier Pla whose first time out on the circuit was in qualifying when he set the fourth-fastest time.